Governor Andrew M. Cuomo today urged New Yorkers living in the New York City metropolitan area to use caution during the Friday morning commute due to snow and high winds. Hazardous driving conditions expected through Friday due to snow and high winds. Albany, NY - March 9, 2017 - Governor Andrew M. Cuomo today urged New Yorkers living in the New York City metropolitan area to use caution during the Friday morning commute due to snow and high winds. A weather system moving across the state will bring cold and blustery winter weather to the Mid-Hudson Valley, New York City and Long Island regions late tonight and during Friday’s morning commute. 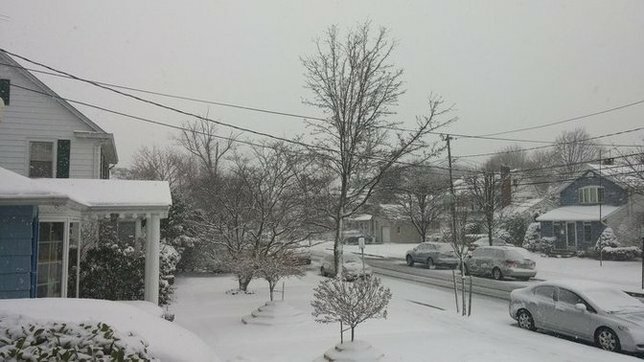 Forecasts call for the Mid-Hudson Valley region to receive two to five inches of snow with 14 mph winds, the New York City area to receive two to four inches of snow with blustery winds 16 to 20 mph, and Long Island to receive two to six inches of snow with winds in the 15 to 18 mph range at the height of the storm. "New Yorkers across the downstate region should be prepared for snow and high winds late tonight and throughout tomorrow’s morning commute," Governor Cuomo said. "We are taking action to prepare for this storm and will be deploying state resources to ensure we’re keeping roads open and mitigating the impact on residents and visitors. I urge everyone in the affected regions to drive safely and take appropriate precautions ahead of the storm." At the Governor’s direction, the ýstate Division of Homeland Security and Emergency Services, State Police, the Department of Transportation and the Thruway Authority have already begun to plan accordingly for weather conditions. In addition, the New York State Emergency Operations Center is in contact with local emergency management offices in the affected regions and will monitor the snow storms today through the weekend. The New York State Department of Transportation has 3,847 operators and supervisors statewide and is ready to respond with 1,479 large plow/dump trucks, 200 medium plow/dump trucks, 324 loaders, 42 truck/loader mounted snow blowers, 61 tow plows, 20 graders and 15 pickup trucks with plows. The Department of Transportation also has more than 443,000 tons of road salt on hand. The Thruway Authority’s winter weather preparations include a 24-hour staff rotation for maintenance personnel, snow removal equipment ready for deployment, and ample salt and fuel supplies to keep the roadways clear and safe. The New York State Thruway Authority has more than 600 supervisors and operators ready to deploy 200 Large Snow Plows, 107 Medium Snow Plows and 54 Loaders across the region with more than 112,650 tons of road salt on hand. Variable Message Signs, Highway Advisory Radio and social media are utilized to alert motorists of winter weather conditions on the Thruway. The New York State Thruway Authority encourages motorists to sign up for TRANSalert e-mails, which provide the latest traffic conditions along the Thruway. Motorists can sign up for TRANSalerts here. Thruway travelers can also get real-time updates by following @ThruwayTraffic on Twitter or by visiting here to see an interactive map showing traffic conditions for the Thruway and other New York State roadways. The New York State Police will add additional patrols during the storm to the affected areas as needed. All 4X4 vehicles are available for deployment, and all troop emergency power and communications equipment in the region has been tested. Motorists are reminded that snowplows travel at speeds up to 35 miles per hour, which in many cases is lower than the posted speed limit, to ensure that salt being dispersed stays in the driving lanes and does not scatter off the roadways. Oftentimes on interstate highways, snowplows will operate side by side, as this is the most efficient and safe way to clear several lanes at one time. Motorists are urged to take extra precautions to account for the reduced speed and mobility of snowplows. When winter storms strike, do not drive unless necessary. If you must travel, make sure your car is stocked with survival gear like blankets, a shovel, flashlight and extra batteries, extra warm clothing, set of tire chains, battery booster cables, quick energy foods and brightly-colored cloth to use as a distress flag. The leading cause of death and injuries during winter storms is transportation accidents. Before getting behind the wheel this winter season, every driver must keep their vehicles clear of ice and snow. Good vision is a key to good driving. Plan your stops and keep more distance between cars. Be extra alert. Remember, snowdrifts can hide smaller children. Subject: LongIsland.com - Your Name sent you Article details of "Governor Cuomo Urges New Yorkers to Prepare for Snow and High Winds in the NYC Area Overnight and Friday"